I found this a terribly frustrating read because, while individual stories were quite good, all together it presented an incredibly depressing picture of human beings: we started out greedy, vicious, aggressive little primates who didn't give a damn about anyone/anything else and we end as greedy, vicious, aggressive little primates who don't give a damn about anyone/anything else. 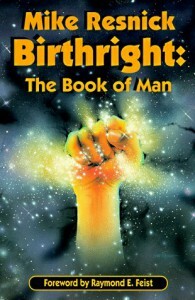 Birthright is a sweeping history of humanity over the 17 millennia of its performance on the galactic stage (before being wiped out by a coalition of other races who finally got tired of humans' uncontrollable aggression), presented in a series of representative short stories from each millennium. It's simplistic and reductionist and nowhere near as good as Resnick can be.